9.26.15 SPECIAL EDITION: What do we do about the Syrian Refugee Crisis? If you’re a regular listener to Two Way Street, you know that I like to build the show around in-depth interviews with one or sometimes two guests every week. It gives me the opportunity to go deeper, to have more intimate conversations with the kind of fascinating people we work to bring in to the GPB studios. But this week’s show is different. This week our conversation centers on a story that’s been captured the headlines for weeks; and this week, we have four guests to discuss the issue. We’re going to be talking about the Syrian refugee crisis. It was just this past Monday that I realized that I simply couldn’t ignore any longer the heart-wrenching images I’ve been seeing of the endless stream of refugees fleeing Syria and looking for asylum in Europe and elsewhere. More than 4 million Syrians have fled their country since the war began in 2011. The vast majority of them have gone to neighboring countries. But some 400,000 have applied for asylum in Europe while thousands of others are adrift on the continent and without anyplace to call home. What can be done to resettle these thousands of families who have escaped from a terrible war? How can the United States help? How many refugees can we accommodate in this country? Here in Georgia? Should we be concerned that some of the refugees might be security threats if they resettled here? How can they be assimilated into our communities, given jobs, housing, food? Fortunately, we have a group of professionals right here in metro Atlanta who have dedicated their careers to working with refugees. Clarkston, Georgia, just outside the City of Atlanta, has become one of the country’s largest resettlement centers for refugees from around the globe. 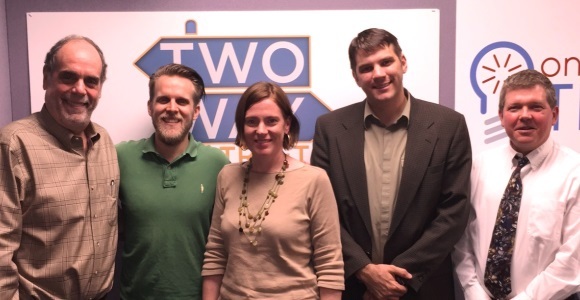 Two of our guests on this show work with refugee relocation organizations. Paideia Mixon is CEO of New American Pathways (Above photo: center), which is one of the largest refugee resettlement organizations in the country. Brian Bollinger is director of Friends of Refugees (Above photo: second on the left), a Christian organization that helps refugees acclimate to life in the United States. Joining them on the panel are Ted Terry, mayor of Clarkston (Above photo: second on the right). He’s already declared that his city is more than willing to take in as many Syrian refugees as the government will send to him. Our final guest is Dr. Chris Brown, vice president for research and analysis at the World Affairs Council of Atlanta (Above photo: far right). I hope that listening to this show gives you a better perspective on the crisis – and on how we all can play a role in helping.